In this era of unprecedented and accelerating changed, Information Technology (IT) is part of the organization’s core fabric. There is, in fact, a symbiotic relationship between core business functions and IT. In fact, in many cases they are inseparable. Information Technology not only enables core functions, it often is what makes them possible. Click on the chart above to learn more about our services. Puffin Advisors’ brings you a skillset which reflects both breadth and depth. Our experience encompasses multiple industries with a focus on healthcare and pharmaceuticals. We enable organizational success through the strategic, innovative, and cost-effective use of both existing and emerging technologies. We apply a unique mix of technical skills, leadership experience, and business acumen. From start-ups to large global organizations, Puffin Advisors can help you address a range of issues through our service offerings. Puffin Advisors is a Boston based IT Consulting firm providing clients with proven and experienced global executive insight. We work with organizations of all sizes seeking to improve the efficiency and effectiveness of their technology investments. 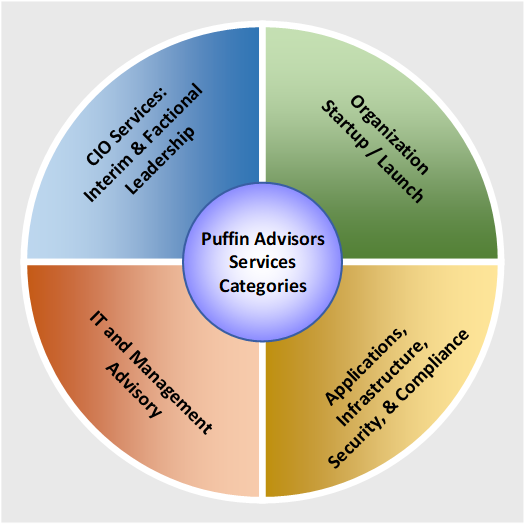 From start-ups looking to determine the IT capabilities they will need, to ongoing enterprises looking to address tactical or strategic issues, Puffin Advisors can help. We understand how high-performing organizations operate and how to apply those lessons to the needs of our clients.